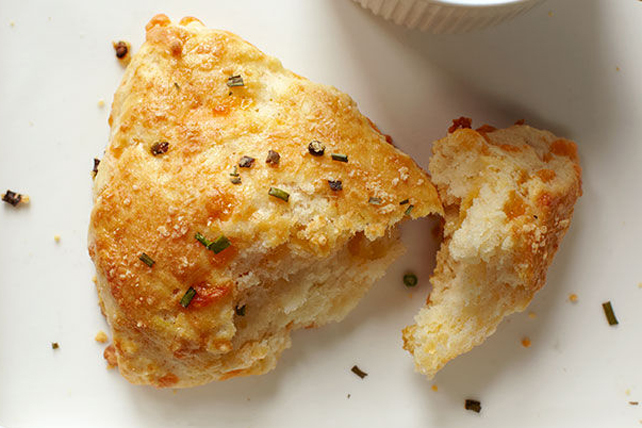 Sprinkled with Parmesan and chives, these Cheddar & Sour Cream Scones emerge from the oven flaky, tender, golden-brown—and delicious! Combine first 4 ingredients in large bowl. Cut in butter with pastry blender or 2 knives until mixture resembles coarse crumbs. Stir in cheddar. Make well in centre of flour mixture. Mix sour cream and milk until blended. Add to flour mixture; stir with fork just until moistened. Spoon onto parchment-covered baking sheet; pat into 10-inch circle. Cut into 10 wedges. Gently separate wedges; brush with egg. Sprinkle with combined Parmesan and chives. Store leftover scones in airtight container at room temperature. Split in half. Fill with sliced deli ham and Kraft Singles Cheese Slices and serve as part of your lunch the next day.